Kremlin spokesman Dmitry Peskov warned Ukraine not to cut diplomatic relations with Russia, or else there will be consequences for both sides. There are reports that the Ukrainian parliament will sever relations when it meets on November 16th. The Kremlin stated the move would would further deepen a crisis between the two countries and end up hurting the interests of both Ukrainians and Russians, reported Reuters. 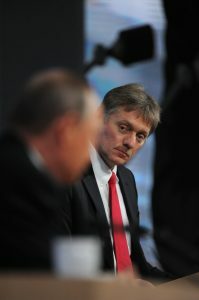 Peskov made the comments while speaking with reporters today on the telephone. Russia annexed the Crimean peninsula, or Krim in Slavic languages, after Ukraine ousted pro-Russian leader Viktor Yanukovych in 2014. Pro-Russian separatists, supported by the Kremlin, then ignited a war in the Donbass region of East Ukraine which smolders to this day, despite the Minsk agreements negotiated by world powers to end the conflict.